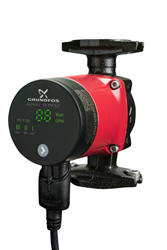 The ALPHA1 circulator pump from Grundfos offers three simple-to-operate constant-pressure modes and other versatility-enhancing features. This energy-efficient, variable-speed circulator is built on the most reliable permanent magnet motor technology platform in the industry. Grundfos is expanding its line of energy-efficient ALPHA circulator pumps with the variable-speed ALPHA1, which has a duty range that can replace every single-speed and 3-speed circulator in its class. ALPHA1 has the highest torque rating and most powerful start feature of any comparable circulator and offers three simple-to-operate constant-pressure modes. The LED display ensures the ALPHA1 is delivering the optimal hydronic heating and/or hot-water recirculation flow rate at the lowest possible energy consumption. Because this permanent magnet motor (ECM) circulator can replace less efficient, standard three-speed and single-speed circulator models, distributors will be able to reduce the variety of models stocked on their shelves and contractors will be able to reduce the number of pumps on their truck. All components of the ALPHA1 are produced and assembled by Grundfos in Fresno, Calif.
“This energy-efficient, variable-speed circulator is built on the most reliable permanent magnet motor technology platform in the industry, the Grundfos ALPHA,” says Kirk Vigil, Director of Sales for Grundfos USA. “Over the last decade, circulators used for hydronic and radiant heating systems have become more energy-efficient thanks to ECM technology, which Grundfos was the first to incorporate in a circulator 16 years ago. “ECM motors and variable-speed control allow these circulators to drastically reduce energy consumption and enhance system performance — proving that not all circulators are created equal,” continues Vigil. The three constant pressure control modes of the ALPHA1 are simple to use with a single push-button control that allows hassle-free operation for installers who can switch between pressure modes depending on the application. ALPHA1 is available in both cast iron and stainless steel models, as well as standard and rotated flange pump housing configurations. Furthermore, ALPHA1 is also available in either line-cord or terminal box electrical connections. At the core of ALPHA1 is an ECM motor featuring a magnetized rotor to avoid motor-slippage problems common to induction-type motors. The result is a dramatically more efficient motor that generates less heat and energy waste, while delivering a starting torque four times higher than a standard induction motor, and stronger than any other ECM pump in its class—a key feature should the circulator experience long periods of idleness. In the case of a blocked rotor, the ALPHA1’s constant restart feature attempts to restart indefinitely every seven seconds. The sophisticated electronics of the ALPHA1 are fully integrated within the motor, which simplifies installation in tight spaces. The easy-to-read LED real-time display shows a flow indicator in gallons per minute and energy consumption in Watts. ALPHA1 offers a flow range of 0 to 19 GPM (0 to 72 Liters per minute) and a head range from 0 to 19 feet (0 to 5.8 meters). It can handle fluid temperatures from 36°F to 230°F (2.2°C to 110°C) with a maximum working pressure of 150 pounds per square inch (psi). -Magnetite Resistance: To prolong pump operation life, the ALPHA series has a magnetite-resistant design with a stainless-steel bearing plate, robust ceramic shaft and ceramic bearing rings, which also provides for superior air venting. Magnetite, or iron-oxide sludge, would normally hamper circulator operation as metal components oxidize inside hydronic systems and these metal rust particles can lead to expensive breakdowns. -Backflow prevention: An integrated check valve prevents backflow from occurring. -Extremely quiet operation: The whisper-quiet ALPHA1 uses ECM, permanent magnet motor technology and a superior hydraulic design, allowing ALPHA1 to operate at 19.2 dB(A) at full speed. -Plug-and-play convenience: Installers have the flexibility to use either a line cord or terminal box for conduit connections. -Multiple Configurations: ALPHA1 comes in both cast iron and stainless steel models, as well as standard and rotated flange pump housing configurations. -Installer-friendly pipe connections: The circulator’s volute has a standard two-bolt flange with a built-in, nut-capture feature that holds the bolt steady during tightening. Spared from having to use a second wrench to keep the bolt from slipping or turning, the installer has a free hand to hold the circulator in place. With an annual production of more than 16 million units, Grundfos is the world’s leading pump manufacturer, serving the residential, commercial-building and process-industry markets, as well as being a major supplier to the ground water, irrigation, water-supply and water-treatment industries. The company specializes in circulator pumps for heating and air conditioning as well as other centrifugal pumps for industrial applications, water supply, sewage and dosing. In addition to pumps, Grundfos also produces standard and submersible motors as well as state-of-the-art electronics for monitoring and controlling pumps. Founded in 1945 in Bjerringbro, Denmark, The Grundfos Group employs 1,200 in the United States and more than 18,000 globally with 83 companies in 56 countries. A top priority on the Grundfos corporate agenda is an active commitment to improving the environment, both in terms of providing innovative pumping solutions as well as reducing the company’s own footprint. The company contributes to global sustainability by investing heavily in research and development to pioneer technologies that improve quality of life for people and care for the planet. For more information, visit us.grundfos.com or follow us on Twitter and Facebook.